The Air Arms S200S is a powerful, accurate and affordable PCP rifle. The stock has been crafted using a beech wood which gives it high aesthetics as well as a durable base to your rifle. The S200 has a semi-match stock design which lines your hand up with the trigger give a secure yet natural grip on your gun. The stock is ambidextrous allowing you to shoot with your preferred hand. The S200 for sale from Air Arms has an adjustable trigger. This allows you to change to point at which the trigger shoots making it more suited to your preferences. This fires at 12ft/lb making them very powerful. This PCP rifle also has a adjustable front scoping mount which can be moved to fit any length scope. The Air Arms S200 uses a bolt action to load the pellet. The removable cylinder allows you to fill the pcp rifle up quickly and efficiently. 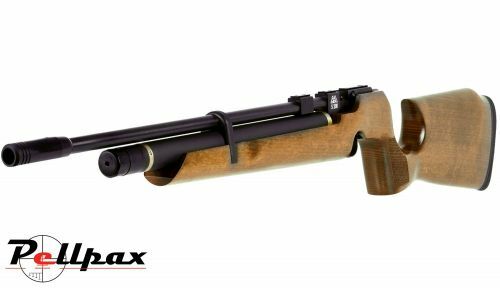 Overall it is an ideal pcp rifle for plinking or stealthy hunting. Add this item to your basket & spend an extra £1.01 to apply for finance.